Elliott’s article is great if you have a pretty solid background in JS, you’ve been writing ES6 for awhile, and you’re ready to grasp the many ways JS applications use closures. This post isn’t meant to address all of those use cases. My goal is to provide you with a foundation so that you can go on to understand those other posts. There are many definitions of closures floating around the internet and most are a dense and full of jargon. Let’s break down some of the vocabulary in this explanation to really get to the heart of what a closure is. I’ve designed a simple diagram to help us visualize what Elliott, 8th Light, and MDN are talking about. We can start by trying to understand the meaning of lexical environment. According to Elliott, it’s a function’s “surrounding state,” or the scope available to a function. In my diagram, the outer function’s lexical environment is represented by the outermost rectangle, which I’ve called the “Outer Function’s Scope.” The Inner Function has access to the “Outer Function’s Scope,” or “lexical environment,” thanks to the use of a closure. In the most basic of terms, a closure is a function within another function. The inner function has access to the outer function’s scope. How do I use a closure? Put it inside another function. Expose it by returning it or passing it to another function. There are a lot of different ways to use and write closures, but I’ll leave you with this simple example, which will springboard you into Eric Elliott’s post. getSum is the outer function. sum is the inner function. It is enclosed by getSum. 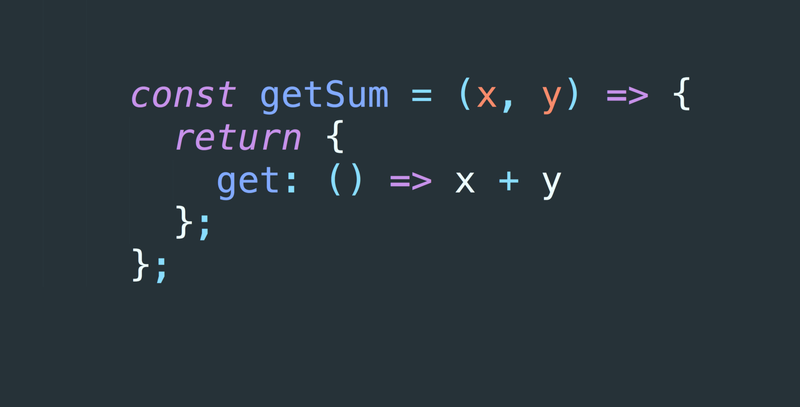 Because sum is returned within getSum, it has access to getSum’s lexical environment. sum has access to x and y, even though I have not explicitly passed x and y into sum as arguments. And that’s about it! I hope this post has set you up to read more complicated explanations of closures, and to begin using them in your own applications.